The SDSU Museum of Biodiversity contains collections of plants and animals used for both research and teaching at SDSU. 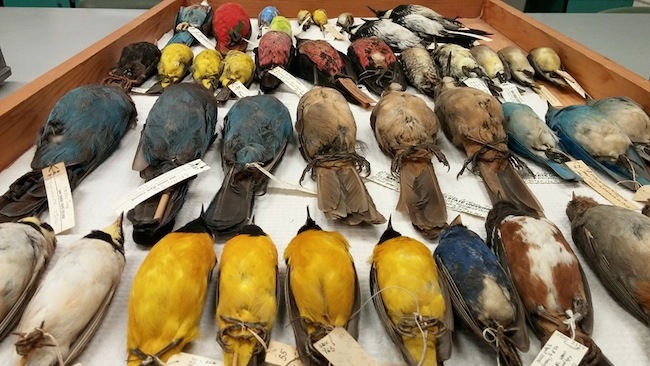 The Ornithology Collection contains about 3,000 specimens, with the oldest specimens dating to the late 1800s. Material in the collection includes skins, tissues, skeletons, nests, and eggs. Most of our holdings are focused on southern California; however, through decades of donations from the San Diego Zoo, we also have an excellent representation of global avian diversity. Specimens in the collection are not only an essential part of many Biology courses, but also form the foundation of many research projects and theses. Thus, the collection is an important resource for both the teaching and research missions of the Department of Biology. Recognizing the importance of preserving tissues for genetic studies, we have been saving genetic material of specimens in the collection since 1998. The SDSU Ornithology Collection also serves as a repository for the genetic resources of the ornithology collections at the San Diego Natural History Museum. Our combined tissue collections contain genetic material for over 3,000 individual bird specimens. For further information about the ornithology collection, please contact the curator, Dr. Kevin J. Burns at kburns@mail.sdsu.edu.